The Kirgiz history can be traced back to the Jiankun people living in the upper reach of Yenisei River 2000 years ago. 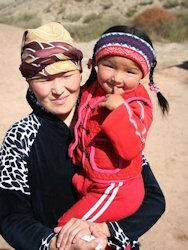 The ancient Kirgiz people are an amalgamation of the Qidan, Turki, Mongolian and Uygur peoples. This combination has created the features of the current Kirgiz. 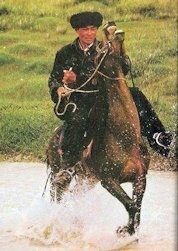 The Kirgiz have lived a herding life for generations. They created their own language, based on Arabic letters. During economic and cultural exchanges, the Han language was gradually adopted into the Kirgiz Uygur and Kazakh languages. The Kirgiz in some localities also uses the Han language. The nomadic Kirgiz live on the plains near rivers in summer and move to mountain slopes with a sunny exposure in winter. 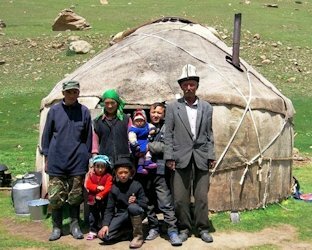 Their material life is closely related to animal husbandry; garments, food and dwellings all distinctively feature their nomadic lifestyle The Kirgiz people live in portable yurts and eat pasture food, such as mutton, beef, yogurt, cheese, milky tea, etc, which are welcomed by other nomadic nationalities. The Kirgiz people believe in Islam and avoid meat from pig, dog, cat, mouse and other ferocious animals. The Silk Road threading through Xinjiang's deserts and mountains carried China's trade westward and eventually opened the way for Islam's expansion eastward. Seven of the 12 minorities here are Muslim, most speak Turkic languages and for centuries used Arabic script. The Kirgiz, who keep Bactrian camels, have reduced their pastoral wanderings as herders of sheep and goats and live in communes during the winter. The Kirgiz are found in the Xinjiang Autonomous Region and in Heilongjiang Province. Most are Islamic, but a few are lama Buddhists. They are part of the Altaic Turkic ethno linguistic group.